Cancer predisposition syndromes affecting the gastrointestinal (GI) tract represent a small proportion of GI cancers and may arise in the background of a polyposis syndrome. The molecular mechanisms underlying these syndromes have been instrumental in our understanding of the molecular basis of development and progression of the more frequent counterpart sporadic neoplasms, sharing many common molecular features. Syndromic hereditary cancers can involve any segment of the GI tract but predominantly involve the colon, and the most common cancers are colorectal adenocarcinomas (CRC). 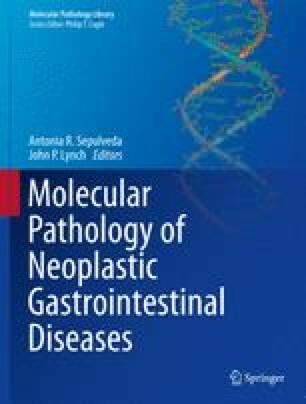 The most frequent inheritable GI cancer syndromes are those associated with germline mutations in the DNA mismatch repair (MMR) genes, in which case cancers do not arise in a polyposis background, and those attributed to underlying germline mutations in the APC or MYH genes in patients who manifest an adenomatous polyposis phenotype in the intestine. In addition to the well-characterized cancer syndromes, there are families with clustering of colon cancer, including patients with colon cancers before age 50, for whom the susceptibility gene loci have not been identified.